What IS That Interesting New Building? There's a new meeting space at Easton that will make the place more adaptable to visitors and residents. 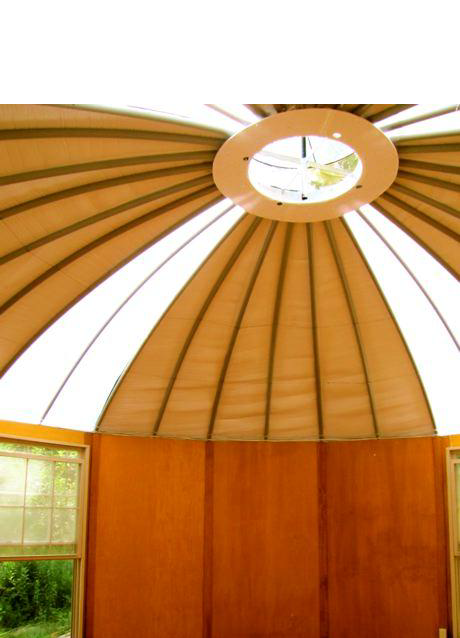 It's a twenty foot diameter yurt with a domed roof, skylights and large, screened windows. A yurt is a round, Turkic or Mongolian portable living structure (also called a Ger). The nomads live in them, then fold them up and move to greener pastures for their Yak herds. The modern interpretation at Easton was built by Moss Tidd and is a far cry from the lattice-work, stick and yak wool felt structures of Asia. The walls are cabinet grade plywood on a galvanized steel pipe frame. The roof is a reinforced vinyl material with high-tech bubble insulation. The openablewindows and central skylight create good ventilation. The yurt is designed as a third meeting space (after the Great Room and Temple). It is perfect for small groups to meet in an intimate setting. When not used as a meeting place, it will serve as a get-away for the volunteers living at Easton. It has electricity, a lovely wool rug and will have Wi-Fi connectivity for laptop/iPad use.